Migrant crisis: Can EU overcome its rifts? In his own idiosyncratic way, European Commission President Jean-Claude Juncker produced a pretty passionate speech on refugees and migration. Europe should bear in mind, he insisted, that many of its own citizens are from refugee families. "We Europeans should know and never forget why giving refuge and complying with fundamental rights is so important," he said. The argument that there is a strong moral imperative, to help people fleeing from persecution and war, does strike a chord with many citizens. But at the same time the migrant crisis has exposed some sharp cultural and political rifts. It means Europeans are going to have to ask some fundamental questions of themselves. Do they care as much as they like to think they do? So at a time when, in Mr Juncker's own words, the state of the EU is not good - with too little Europe and too little union - he issued an appeal for unity. Will he get what he hopes for? In part, I think he will. The idea of mandatory quotas of arriving refugees will continue to be controversial. But countries like Spain and Poland that had criticised the proposal have softened their positions. Extremely harsh words were spoken at a migration summit earlier in the year. Over the summer, though, the sheer scale of the refugee problem has concentrated minds. Turning the idea of quotas into a permanent scheme to deal with future crises will be even more difficult. With Germany and France on board, though, the momentum is there. But Mr Juncker knows - as do other EU leaders - that such displays of "solidarity" need to be combined with other practical proposals: for strengthening external borders (a Hungarian fence, anyone? ); and for sending failed asylum seekers home more efficiently. So more unity? Yes. But difficult political battles ahead? Definitely. As with the eurozone crisis, one of the biggest challenges for political leaders will be to implement effective policies quickly enough to keep pace with events on the ground. And that doesn't just mean mapping the number of arrivals, but staying in touch with the reaction from communities across the EU. 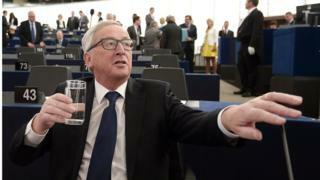 "It is Europe today that represents a place of hope and a haven of stability in the eyes of men and women in the Middle East and Africa," Jean-Claude Juncker argued. "This is something to be proud of and not something to fear." Perhaps so. But it also pushes the EU into new and uncertain territory. How well will the leaders lead?